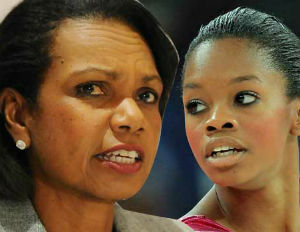 Gabby Douglas’ outstanding performance in the London Olympics this summer has caught the attention of Condoleezza Rice, according to TMZ. Douglas is the first African-American and first woman of color in Olympic history to become the individual all-around champion, and the first American gymnast to win gold in both the individual all-around and team competitions at the same Olympics. She was also a member of the gold-winning U.S. team at the 2011 World Championships. While many have focused on Gabby’s nickname “the flying squirrel” and the controversy around her hair, the former secretary of state believes she is a hero. “I’m proud of their team gold and thrilled for Douglas and her momentous accomplishment as the first African-American to win the individual all-around gymnastics title,” said Rice.